Judging by his debut album, which was released just last week, Jordan Witzigreuter is well on his way to mastering the art of catchy pop. I’m Alive, I’m Dreaming showcases Witzigreuter’s knack for combining pop, electronics and even hip-hop undertones into a light-hearted, danceable blend. Just ask Fall Out Boy’s Pete Wentz. Witzigreuter signed to Wentz’s Decaydance Records and to Sire Records in November, and his debut will be the first release from the collaboration of the two labels. 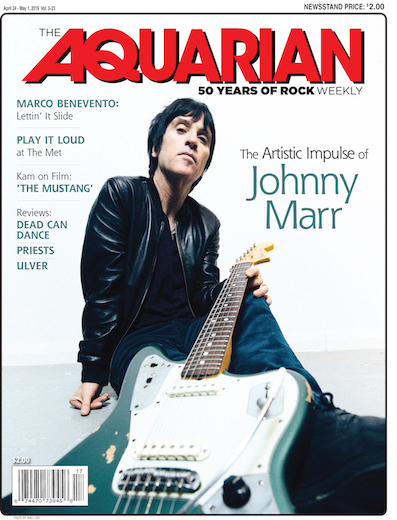 However, as the 20-year-old singer, songwriter and musician from Fort Wayne, IN, told The Aquarian, he has certainly paid his dues. Working under the moniker The Ready Set, Witzigreuter promoted, managed and booked tours himself at the start of his career. Literally minutes after finishing a performance on the Bamboozle Roadshow tour, Witzigreuter spoke to The Aquarian about his new album, jumpstarting his career and his live shows. Your debut full-length, I’m Alive, I’m Dreaming, is coming out in a few days. Are you excited about that? Very excited. It’s like four days I think—it’s crazy. It’s good to finally have an album out. How long has this album been in the making? Some of the songs were recorded over a year ago, and then some of the songs were only recorded a few months ago. It’s been a long, long process, but I think we got the best possible songs we could have on this album, especially for a debut thing. I think it’s just the best representation. So the songs you wrote a year ago, were they written with this album in mind? When I write songs, I don’t really keep so much an album in mind because there are like 30 other songs that didn’t make the album. When I write a song, I keep in mind just that song. I just kind of focus on making that the best it is and not really wondering if it’s going to make the cut or if it’s going to be good enough. I try not to get too attached to my demos or anything; I try to take them for what they are. I know they’ll get torn apart, I know they’ll get messed with and it always usually ends up being for the better. How did you pick the songs for the album then? It was a lengthy sort of a choosing process. I just wanted it to be the eight catchiest, best pop songs I could possibly write on this album. I had input from my management, I had input from my labels, and I think we all just agreed on what were the strongest songs. Now you’re signed to Pete Wentz’s new label. How did that come about? It was pretty much from my management. I started working with my management a little over a year ago, and we started showing stuff to labels, started doing showcases. My manager knew Pete and some of the others at Decaydance. They just started talking and Pete wanted my number, so Pete texted me and we started just talking. He liked the way I wrote songs, and he liked the way my voice went with the songs. I liked the way they ran things over there—kind of a family-oriented, sort of grassroots way of doing things over there. They cared a lot. That’s what I was looking for in a label—someone who was going to fight for me and not just be lukewarm about it. I wanted someone who was behind my music and behind everything I want to do 100 percent, and that’s what they were. They were the natural place for me to want to go, and I felt comfortable with them. After six months of talking with them and other labels, in November I signed and it’s been going well since then. Is there anything you miss about touring on your own and setting everything up by yourself? Not really. Booking tours was the hardest thing that I ever did. That was the one thing I hated ever since day one. I did all my own tours, I booked everything, I did my management stuff, I did all my merch and everything, and it’s literally the hardest thing. If you don’t know people, you’re booking shows through kids, you’re booking shows through MySpace and everything. You spend a month booking a two-week tour and half the shows fall through—it’s terrible. But I guess at the same time it has its charm because that sort of thing—touring in an SUV with no trailer, just terrible shows that I booked myself—makes me appreciate being on a tour like this in a comfortable bus. It’s a humbling sort of thing. So when you were touring on your own, were you able to meet a lot of performers who were in the same situation as you? Yeah, definitely. There are a lot of friends on any tour. After a few days, you get to know everybody and it’s cool because pretty much everybody’s on the same page, everybody’s trying to do the same thing. It becomes sort of like a family on tour and it’s good, it’s really fun. You would hang out with everybody everyday. Then after months on the road when you see them on a different tour, it’s awesome. That’s kind of what this tour has been because we’ve toured with a lot of these bands out with us before so it’s like a big family reunion tour. Do you have any advice for do-it-yourself artists who are starting out the same way you did? If they want to do what I did, it’s pretty much a matter of putting your entire heart into it. It’s just 50 percent talent, 50 percent sacrifice and just work. It’s a crazy amount of work. I spent six to eight hours a day on MySpace just promoting myself, talking to people, trying to make something of my music and trying to get on tour. That’s what you have to do. You have to be able to spend all your time on that, and you just have to have faith in yourself and have a very, very strong work ethic I think. Do you think that’s something a lot of people don’t realize in the beginning—that it’s not the glamorous rock star life when you’re first starting out? Definitely, yeah. Honestly, when I started out I thought it was going to be way easier than it is, but you get dealt the cards you’re dealt. Some people get their careers handed to them, and I’ve never been a big fan of that. Some people don’t have to do a thing; they just all of a sudden shine and they’re huge. Other people have to take the hard way, do all the DIY tour stuff, do everything in that sort of world. Actually, the way I feel is I wouldn’t have it any other way than that because every single small success is more meaningful to me than somebody who’s getting the success without putting in the work. It keeps me grounded and keeps my head on straight. So you play all the instruments on your recordings, is that correct? So which instruments do you play—drums, keyboard? Yeah, drums, keyboard, bass. The only instrument I don’t play is guitar, but I’m slowly working on that. A lot of the album is very program-oriented, so there’s a lot of programming, a lot of keyboard, synthesizer kind of stuff. That’s how I kind of got started—through all the MIDI keyboard, programming kind of stuff, Logic and Garageband. Does that make writing and recording a really personal experience for you because it’s all your own work and just you writing, recording and playing? Definitely, definitely. I wouldn’t want it to be any other way. It’s good because everything you hear is coming completely from me. Of course, when you go in with your demos to your producer, you get input, you get ideas from them, you change arrangements and make things better, but still being just me on the recordings kind of makes it a little more personal. And when you play live, do you bring in other musicians to help you play your songs? Yup, I have a guitarist, bassist and drummer. Do you enjoy playing your songs with other musicians or is it kind of weird to hear someone else playing parts you’re used to playing yourself? It’s great. Since so much of it is program-oriented, I’ll send them live tracks of the songs and be like, ‘Write a part to it, do whatever you want to do.’ Then when it comes time to practice and put things together, we’ll go back to it and we’ll figure things out, make it sound good and just kind of tighten things up. So I try to let them take liberties and do what they want to do with the songs because all I want on tour is for everyone to have a good time. Is there any show you’re looking forward to in particular for this upcoming tour? I’m really excited about New Jersey. New Jersey is one of my favorite places to play, and we’re actually playing at Six Flags in New Jersey. A few months before I started this, I went to a show there. It was Boys Like Girls, Good Charlotte, Metro Station and The Maine. I saw it, there were like 10,000 people and that was one of those moments where I was like, ‘Oh, I want that, I really want to do that.’ I was actually telling Martin from Boys Like Girls about this a couple of days ago. It’s crazy that I went to that show and that inspired me, and now I’m playing that same place on tour with the bands that I went and saw there. It’s pretty mind-blowing. The Ready Set will perform at Six Flags Great Adventure in Jackson, NJ, on June 24 and Nassau Coliseum in Uniondale, NY, on June 26. PLEASE SOMEONE SAVE THAT POOR BOY FROM THE RACCOON THAT’S ATTACHED ITSELF TO HIS HEAD! LOOK AT THAT GRIMACE! HE DOESN’T HAVE LONG!!!!! jordan is so cute<333 i loveeeeeee him!! your music is pretty amazing. Ive heard about you a few months ago and now im a completely obssessed fan. All i think about is TRS. Im not like your fake fans whom say your there favorite just so people can notice them and junk. I LOVE your hit “Love Like Woe” I listen to it before school,during, and after. I would also literally wait all day for your song to come up on my television. It’s such an amazing song and I think im the only fan of yours from all my friends but i dont mind. :) Your music is fantatsic and im trying my best to meet you in person or even see you in a tour. I’ve never had due to money problems where facing but I should soon wish to go to one i hear there awesome!! Well my main point is this. Your an amazing artist with great morals in your music and you have completely inspired me. Ive been so inspired to you im thinking of participating (for the 1st time) in Rodriquez’s prep academy’s talent show (if they have one) =). Stay awesome. Btw your the cutest thing ever!! Love your hair it’s cute haha:). Wish you like for the future Jordan Witzigreuter!!! just come to 10604 central ave.
ommmggg jordan your sooooooo hott!!!!! :) ctest thing in the world!! !<3 love u! ur awesome NEVER EVER give up your career ur the hottest thing living on planet earth!!! Jordan!! I love you so much! your voice is so amazing!! your so cool ! i love you !